Ladies and gentlemen, step right up, don’t be shy, and enter the rhyming gyre of glosas, forty-four line rock operas, poetic pas de deux, created by troubadours of the medieval Spanish courts. 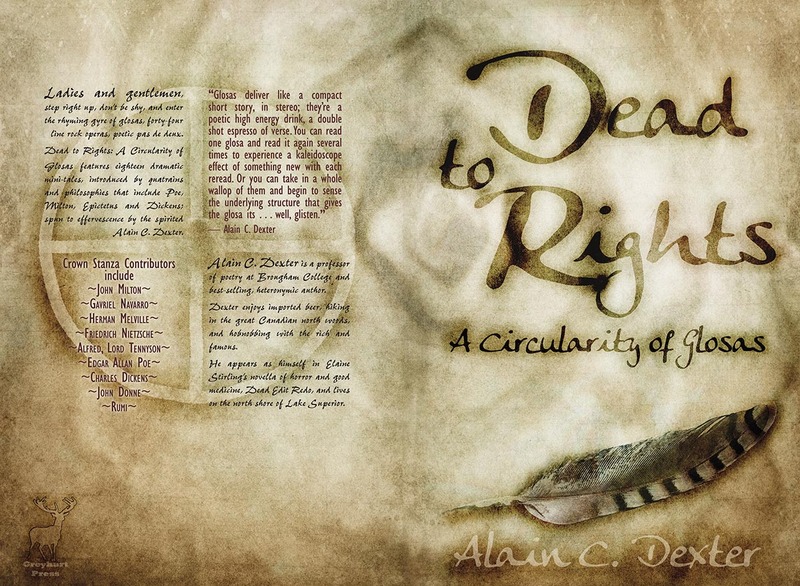 Dead to Rights: A Circularity of Glosas features eighteen dramatic mini-tales, introduced by quatrains and philosophies that include Poe, Milton, Epictetus and Dickens; spun to effervescence by the spirited Alain C. Dexter. John Milton, Gavriel Navarro, Herman Melville, Friedrich Nietzsche, Alfred, Lord Tennyson, William Butler Yeats, Charles Dickens, Edgar Allan Poe, John Donne, Rumi, John Keats, William Blake, Rainer Maria Rilke, Epictetus, Saggil-kīnam-ubbib, Enheduanna, Pablo Neruda. 14 March 2013 — Book launch day. Read the press release. Your dentist probably never urged you to gloss after a meal, let alone each of its courses; though had he known you were reading these two new releases, he might have. Many flavors linger on the palate to savor during the pleasure of their digestion. Make no mistake—this pair of complexly wrought symbiotic volumes is about poetry and a poet and how those processes are mutually creative—it is the reader’s pleasure to discover the process and proportion. Stirling presents us with a splendid meal served with tightly polished cuisine wrapped delightedly with well composed flavors of intrigue, imagery, ingenuity and imagination. But it is not those lower case condiments of “i’s” that hold the key to this interlocked pair of books, but rather the main course capital “I’s” and their voices. Spanning history from some of the earliest known form writings, moving through a wide spectrum of classical poetical voices Stirling’s fast paced narrative style keeps the reader’s interest moving along at remarkable speed through subject matter even many a literature major may find a bit dry. Her vocabulary dazzles with it’s range from esoterically ancient to bleeding edge contemporary, alternately taking us seesawing through the deep past and what may be the fringes of future science while keeping the tale well grounded in traditional native healing processes and still allowing space for flights of metaphysical visions to take wing. Dexter comes alive through his work and through this biographical expose of his life, death and resurrection. The discerning reader will come away from the absorption of this tour de force by a distinguished young poetic voice wondering if Stirling herself is not a composite of characters in contact with an ancient line of muses from which she distills her own special brand of luster. The brilliance with which she shines in both pose and poetry will not easily nor soon be forgotten in her nearly single handed successful attempt to resurrect an ancient form. Enjoy the effort—this Stirling has been well polished to serve readers a feast with many unexpectedly delicious flavors and textures. A grand belch of satisfaction is sure to follow! And the resulting smiles will do your dentist proud!